Since I treat all life equally, regardless of whether or not it has a face, I am happy to eat meat just as much as I am happy to eat fruit or vegetables, fish, or anything else that’s not going to poison me. To a fair degree I care about how the thing I’m going to eat was raised or grown and then killed. Probably not as much as I should, but I rebel against all the greenies and nutters who doth protest too much. They are the ones who care how animals are slaughtered yet think nothing of eating vegetation whilst it is still alive. But it came to my attention how barbaric the halal and kosher meat production is. In these modern times it has no need to be. Because of some old fashioned irrelevant and cruel ritual, halal and kosher preparation requires that a distressed and frightened animal is hung upside-down. It remains fully conscious as its throat is cut and its blood pumps out onto the floor until its heart has nothing left to pump and fails. It dies a slow and painful death, accompanied by its screams of pain and terror as it thrashes and jerks its body about. All animals killed in accordance with halal and kosher ritual, are killed in this cruel manner. Not just some of them, all of them. Anybody daring to ask for animals to be killed humanely is immediately shouted down as anti-Semetic or anti-Islamic, rather than anti-cruelty to animals. The usual progressive lobby groups won’t protest of course, because they are far too afraid to say anything against the ‘multiculturalism’ that has brought with it this cruelty to animals that dominates meat production in the UK. More and more places serve only kosher or halal meat. It is getting increasingly hard to find meat that was prepared in a humane fashion. Some halal meat can be killed humanely first (usually with a bolt) and then slaughtered in accordance with the old fashioned rituals. However, all kosher meat has to be slaughtered cruelly. By just accepting this slow and creeping step backwards to the dark ages, and being too frightened of the repercussions of saying anything, we are forgetting and leaving behind our compassion and humanity. We are joining Muslims and Jews back in the barbaric and cruel days we also once took for granted. It is getting increasingly hard to avoid cruel halal and kosher meat in the UK. In order to avoid offence to Muslims and Jews, such meat is now being rolled out as standard throughout most chains, such as KFC, Subway, etc. Indeed, to avoid offence to Islam and Judaism, bacon is missing from the menu in large parts of the country. I’m guessing the best call to action for those who object to the barbaric animal cruelty of kosher and halal preparation would be to avoid it. It’s the simplest solution. 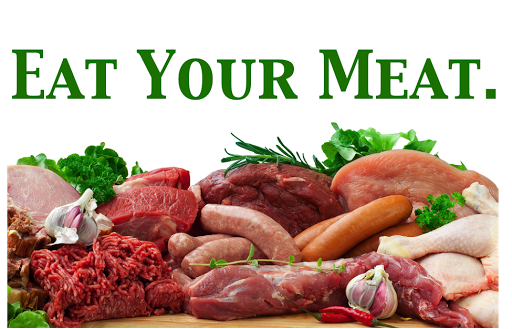 Avoid takeaway food that serves cruelty-intense produced meats. This will mean avoiding a lot of Indian and Kebab based takeaways, but the Chinese and Italians tend to use proper meat. To emphasise the point, I’ve taken to phoning a takeaway, then after placing a fair order, saying as an after-thought, “Oh and can you use non-halal meat please?” When they say they only use halal meat, I respond that I don’t eat meat that’s been produced cruelly, and cancel the order. It’s not always possible to tell that cruel kosher or horrendous halal meat has been used. It seems to be creeping in everywhere and anywhere. Even shops selling meat are sneaking in halal stuff rather than selling cruelty-free stuff. But, if we all do our part by refusing to eat cruelly produced meat, then the advancement of halal and kosher only products into the mainstream will be challenged. Where we currently see the Arabic word for halal, or the actual word Halal on more and more mainstream shops, it would be nice to see a mark or logo that indicates humanely produced meat is available as standard on the premises rather than cruelty-biased meat. Together we can challenge this outrageous barbarism.